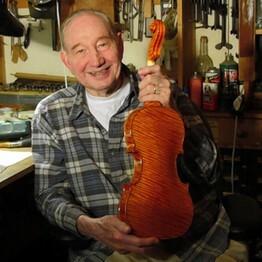 Master of Chicago family's violin-making tradition dies | LEARN TO PLAY THE VIOLIN FOR FREE! Following a family tradition that he worked to perfect, Carl Becker became one of the most acclaimed violin makers of his time. Symphony orchestras around the world feature players who depend on Mr. Becker’s instruments, known for their bright, loud sound. Others are collected by wealthy amateurs. “He was, in my opinion, the Twentieth Century’s outstanding maker of new violins, violas and cellos, as well as a meticulous restorer,” said Charles Beare, a London-based violin dealer. Mr. Becker died Jan. 30 at age 93.